General Assembly President Vuk Jeremic briefs press. Giving the General Assembly a more prominent role in discussions on global economic governance and strengthening efforts to achieve the peaceful resolution of disputes will be among the priorities for the 67th session, the President of the 193-member body said today. 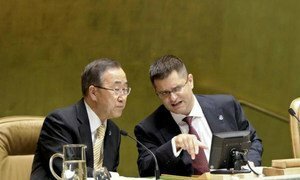 “The next 12 months are probably not going to be remembered as the easiest 12 months in the history of mankind,” Vuk Jeremic told a news conference at UN Headquarters in New York, following the conclusion of the Assembly’s high-level General Debate. “We are faced with a deteriorating security situation in a number of corners of the world; the world is not out of the economic crisis; there is a huge amount of geo-political volatility and uncertainty that is characterizing the world of today,” he added. 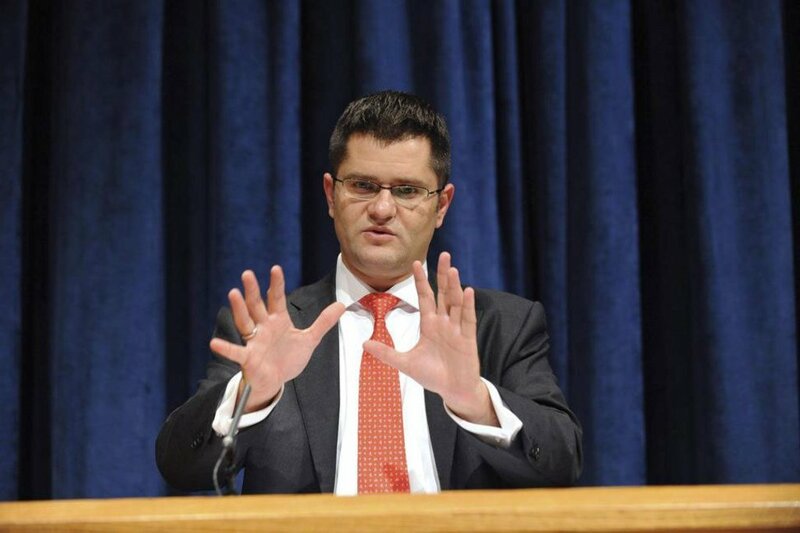 Mr. Jeremic has chosen the peaceful resolution of international disputes as the overarching theme for the Assembly over the next 12 months. Other priorities for the session will include devising the sustainable development goals, giving the Assembly a more prominent role in the global economic governance discourse and enhancing the role of the UN-backed Alliance of Civilizations and strengthening cooperation between that initiative and the Assembly. The Assembly has been mandated to follow up on the UN Conference on Sustainable Development (Rio+20) held in Brazil in June, Mr. Jeremic said, adding that a group of 30 countries need to be put together to devise the sustainable development goals. Closely linked to this is the design of the global development agenda beyond 2015, the target date for the achievement of the anti-poverty targets known as the Millennium Development Goals (MDGs). Secretary-General Ban Ki-moon has appointed a high-level panel of eminent persons to provide recommendations on the post-2015 development agenda and report to him by 31 May 2013. The President also cited the need for a “consultative mechanism” between the Group of 20 leading economies and the rest of the world – or ‘group of 173’ as he described it – to ensure a more inclusive approach to debating world economic governance issues. Such a mechanism can enable the ‘G173’ put forward their views and ideas, while the G20 countries can benefit from hearing the rest of the world’s ideas and thoughts, he said. There will be consultations on the holding of a high-level debate in 2013 with the aim of creating a consultative mechanism, with the Assembly at its heart. Mr. Jeremic said he will also work to enhance the role of the Alliance of Civilizations, and seek ways to regularize and strengthen the cooperation between that initiative, which seeks to promote cross-cultural understanding and tolerance, and the Assembly. At the heart of this cooperation, he said, will be trying to spread a culture of tolerance and mutual understanding in the context of working to achieve the peaceful resolution of disputes. Strengthening the role played by outside experts in the Assembly and in UN deliberations will also be crucial, said the President. “Over the past several decades, our debates have been enriched, and quite substantially so, by views of civil society representatives. But with notable exceptions, I believe the General Assembly has not yet found a way to draw upon the tremendous work done by world public policy institutes and think tanks,” he said, adding that he will try to further engage them in the Assembly’s deliberations. The United Nations General Assembly today opened its 67th session with an urgent call for cooperation to tackle the economic and political uncertainty which is being experienced in many parts of the world and ensure there are peaceful solutions to international disputes.